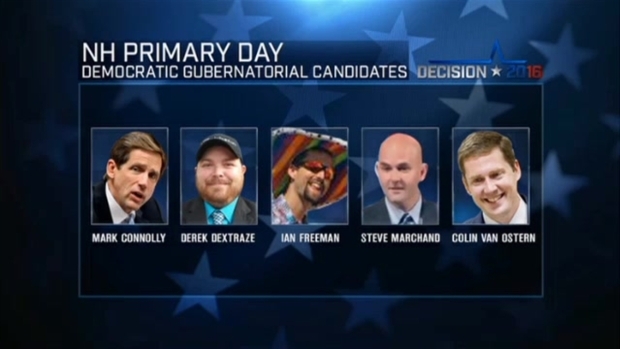 Candidates are getting off to an early start as New Hampshire voters choose their nominees for governor, U.S. Senate and the U.S. House of Representatives. New Hampshire Secretary of State Bill Gardner is expecting 126,000 Republicans and 86,000 Democrats to vote. Colin Van Ostern wins the Democratic nomination for Governor in New Hampshire while results have still not come in for Ted Gatsas, Frank Edelblut, Chris Sununu and Jeanie Forrester who are vying for the Republican nomination. Democrat Colin Van Ostern is pledging to focus on "good jobs, good schools and good access to health care" as he accepts his party's nomination for governor. Van Ostern, 37, has defeated rivals Mark Connolly and Steve Marchand to represent his party in the race to replace outgoing Democratic Gov. Maggie Hassan. Speaking to supporters in Manchester, he's pledging to focus on ending the state's drug crisis, funding full-day kindergarten across the state and protecting state dollars for Planned Parenthood. Van Ostern is serving his second term on the Executive Council, a five-member body with approval over state contracts and gubernatorial nominations. He's also worked in the private sector at Stonyfield Yogurt and Southern New Hampshire University. Manchester Mayor Ted Gatsas and Sen. Jeanie Forrester have conceded in the Republican primary for governor. Executive Councilor Chris Sununu and state Rep. Frank Edelblut are locked in a close battle for the nomination. Democratic and Republican voters in New Hampshire are choosing their nominees for governor and both houses of U.S. Congress. Gatsas says he will support the winner and is happy to get back to running the city of Manchester. He is in his fourth term of mayor. "We've got to be as tough in a loss as we are in the victories," he told his supporters at a Manchester gathering. Republican U.S. Sen. Kelly Ayotte has comfortably defeated primary challenger Jim Rubens. She's now officially facing Democratic Gov. Maggie Hassan in one of the country's most closely watched U.S. Senate contests. Polls continue to show the race in a dead heat and roughly $100 million in outside spending is expected to pour into the state. 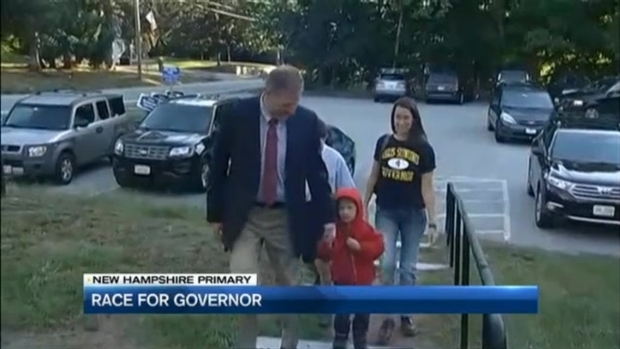 Rubens also ran unsuccessfully in the 2014 Republican primary against Scott Brown. Ayotte has angered some more conservative members of the Republican base over several of her more moderate positions, such as her support for the Clean Power Plan. But Rubens failed to capture a large following. In the 1st Congressional District, it is still a close race between Republican U.S. Rep. Frank Guinta and his primary challenger, Rich Ashooh. Guinta has struggled since last year, when the Federal Election Commission said he took illegal campaign donations from his parents. Former state Rep. Jim Lawrence will challenge Democratic U.S. Rep. Annie Kuster after winning his party's primary in New Hampshire's 2nd Congressional District. Lawrence defeated state Rep. Jack Flanagan and five others in Tuesday's GOP primary. Kuster, who has represented the district for two terms, was unopposed on the Democratic side. Lawrence, who lives in Hudson, is a U.S. Air Force veteran who now runs construction consulting firm. He campaigned on a theme of cutting waste in Washington, reducing bureaucracy and returning power to the people. This was Lawrence's second run for Congress. He finished third in the 2014 primary.